Claude Monet, "Water-Lily Pond, Symphony in Green"
Water-Lily Pond, Symphony in Green, Claude Monet 1899, oil on canvas 89 x 93 cm, Mus�e d Orsay, Paris France. Painted in Monet s garden at Giverny. In 1893 Monet had a pond dugged and he decorated it with all sorts of waterlilies. A simple curved bridge was built in 1895. It evocates japanese footbridges but is painted in green instead of red. 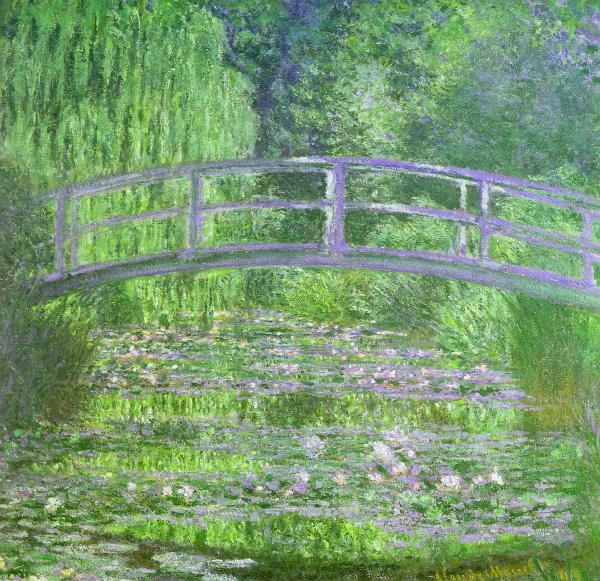 Monet was so fond of his bridge that he took it as the main subject of more than 40 paintings. Water-Lily Pond, Claude Monet 1899, oil on canvas 93 x 74 cm, Metropolitan Museum of Art, New York USA. Features the Japanese Bridge. Water-Lily Pond, Claude Monet 1899, oil on canvas 81 x 100 cm, National Gallery of Art, Washington, D.C. USA. The japanese footbridge. Water-Lily Pond, Claude Monet 1899, oil on canvas 89 x 92 cm, The National Gallery, London Great Britain. Japanese Foot Bridge Giverny.